The global diabetic ulcers treatment market was valued at approximately US$ 7.3 Bn in 2017 and is anticipated to reach a value of approximately US$ 13.6 Bn by 2026, expanding at a CAGR of over 7.0% from 2018 to 2026. The global diabetic ulcers treatment market is driven by the rise in prevalence of diabetic foot ulcers, increase in geriatric population, and surge in adoption of technologically advanced wound care products. Furthermore, rise in patient awareness and healthcare expenditure and technological advancements are expected to drive the market during the forecast period. The global diabetic ulcers treatment market has been segmented based on ulcer type, treatment type, grade, end-user, and region. In terms of ulcer type, the global market has been classified into foot ulcer, mouth ulcer, skin ulcer, corneal ulcer, and others. The foot ulcer segment has been further sub-segmented into neuropathic ulcers and ischemic ulcers and neuro-ischemic ulcers. Based on treatment type, the diabetic ulcers treatment market has been categorized into wound care dressings, wound care devices, active therapies, and others. The wound care dressings segment has been further sub-segmented into antimicrobial dressings, foam dressings, film dressings, alginate dressings, hydrogel dressings, and other dressings. Based on wound care devices, the market has been sub-segmented into negative pressure wound therapy, ultrasound therapy, and HBOT and electromagnetic therapy. The active therapies segment has been further split into skin grafts & substitutes, growth factors, and hemostatic agents and sealants. The others segment has been further sub-segmented into pressure relief devices, traditional wound care products, and others. Based on grade, the market has been classified into grade 1, grade 2, grade 3, grade 4, and grade 5. In terms of end-user, the market has been bifurcated into hospital inpatient settings, hospital outpatient settings, community health centers, and home health care. Based on region, the global market has been segmented into North America, Europe, Asia Pacific, Latin America, and Middle East & Africa. Based on ulcer type, the foot ulcer segment is anticipated to dominate the global diabetic ulcers treatment market, owing to high incidence of diabetic foot ulcers. In terms of treatment type, the wound care dressings segment dominated the global diabetic ulcers treatment market in 2017. In terms of grade, the grade 1 segment dominated the market in 2017. It is expected to maintain its dominant position in the market during the forecast period. Based on end-user, the hospital inpatient settings segment accounted for a prominent share of the market in 2017. It is expected to dominate the market during the forecast period. Increase in patient population and improvement in health care infrastructure are expected to drive the segment during the forecast period. North America held a significant share of the global market in 2017. Rise in the prevalence of diabetes, increase in health care expenditure, rise in mergers & acquisitions, and robust product pipeline are anticipated to drive the market in the region during the forecast period. Europe is a mature market for diabetic ulcers treatment. Therefore, the growth rate of the market in the region has been sluggish due to a well-established network of major market players, which creates relatively fewer opportunities for growth and business expansion for new market entrants. However, a rise in the geriatric population and favorable health care reimbursement regulations are likely to drive the market in the region during the forecast period. Asia Pacific is an emerging market offering significant potential. Expansion of the market in the region can be ascribed to the emergence of strong local manufacturers offering technologically advanced products at lower prices and increasing awareness among people about early diagnosis of chronic wounds. Major players operating in the global diabetic ulcers treatment market include Smith & Nephew plc, Integra Life Sciences Corporation, Hill-Rom Holdings, Inc., MölnlyckeHealth Care AB, Essity Aktiebolag, Cardinal Health, 3M Healthcare, B. Braun Melsungen AG, AcelityL.P., Inc., and ConvaTec, Inc. An increase in mergers & acquisitions, new product development, and strategic collaborations between major companies and governing authorities is expected to drive the global market during the forecast period. This report analyzes the current and future scenario of the global diabetic ulcers treatment market. Rise in the prevalence of diabetic foot ulcers, surge in adoption of technologically advanced wound care products, increase in geriatric population, and rise in patient awareness and health care expenditure are key factors that are projected to drive the global market during the forecast period. The global diabetic ulcers treatment market report comprises an elaborate executive summary, which includes a snapshot that provides information about various segments of the market. It also provides information and data analysis of the global market with respect to the segments based on ulcer type, treatment type, grade, end-user, and region. A detailed qualitative analysis of drivers and restraints of the market and opportunities has been provided in the overview section. Additionally, the section comprises a competitive matrix and company profiles along with business overview to understand the competitive landscape in the market. This section of the report also provides market share analysis by key players, thereby presenting a thorough analysis of the overall competitive scenario in the global diabetic ulcers treatment market. The global diabetic ulcers treatment market has been segmented based on ulcer type, treatment type, grade, end-user, and region. In terms of ulcer type, the global market has been classified into foot ulcer, mouth ulcer, skin ulcer, corneal ulcer, and others. The foot ulcer segment has been further sub-segmented into neuropathic ulcer and ischemic ulcer and neuro-ischemic ulcer. Based on treatment type, the diabetic ulcers treatment market has been categorized into wound care dressings, wound care devices, active therapies, and others. The wound care dressings segment has been further sub-segmented into antimicrobial dressings, foam dressings, film dressings, alginate dressings, hydrogel dressings, and others. The wound care devices segment has been further split into negative pressure wound therapy, ultrasound therapy, and HBOT and electromagnetic therapy. The active therapies segment has been further sub-segmented into skin grafts and substitutes, growth factors, and hemostatic agents and sealants. The others segment has been further bifurcated into pressure relief devices, traditional wound care products, and others. Based on grade, the market has been classified into grade 1, grade 2, grade 3, grade 4, and grade 5. In terms of end-user, the market has been split into hospital inpatient settings, hospital outpatient settings, community health centers, and home health care. Based on region, the global market has been segmented into North America, Europe, Asia Pacific, Latin America, and Middle East & Africa. The market size and forecast for each of these segments have been provided for the period from 2017 to 2026, along with their respective CAGRs for the forecast period from 2018 to 2026, considering 2017 as the base year. 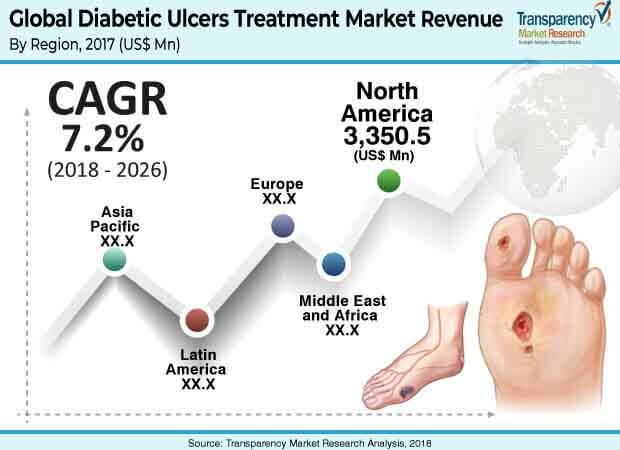 In terms of region, the global diabetic ulcers treatment market has been segmented into North America (the U.S. and Canada), Europe (the U.K., Germany, France, Spain, Italy, Russia and Rest of Europe), Asia Pacific (India, China, Japan, Australia & New Zealand, and Rest of Asia Pacific), Latin America (Brazil, Mexico, and Rest of Latin America), and Middle East & Africa (GCC Countries, South Africa, Israel, and rest of Middle East & Africa). The market size and forecast for each of these regions and the mentioned countries/sub-regions have been provided for the period from 2017 to 2026, along with their respective CAGRs for the forecast period from 2018 to 2026, considering 2017 as the base year.The research study also covers the competitive scenario in these regions. The report also profiles major players in the global diabetic ulcers treatment market based on various attributes such as company overview, financial overview, product portfolio, business strategies, and recent developments. The major players profiled in the market report include Smith & Nephew plc, Integra Life Sciences Corporation, Hill-Rom Holdings, Inc., MölnlyckeHealth Care AB, Essity Aktiebolag, Cardinal Health, 3M Healthcare, B. Braun Melsungen AG, AcelityL.P., Inc., and ConvaTec, Inc.